Each tablet contains Vinpocetine BP 5 mg.
Vinsetine improves cerebral metabolism. It increases the glucose and oxygen consumption and utilization of the brain tissue, improves the hypoxia tolerance of the brain cell, shifts glucose metabolism towards the energetically more favorable aerobic pathway, exerts antioxidant activity, as a result of all the effects it is a cerebroprotective compound. Vinsetine considerably improves cerebral microcirculation. All forms of acute and chronic cerebral circulatory insufficiency: TIA (Transient Ischaemic Attack), reversible ischaemic neurological deficiency, progressive stroke, completed stroke, post-apoplectic conditions, multi-infarct dementia, cerebral arteriosclerosis, post traumatic, hypertensive encephalopathy etc. For the reduction of psychic or neurological symptoms of cerebral insufficiency (e.g., memory disturbance, dizziness, headache, aphasia, locomotor disorder etc.). Ophthalmology: It can be used for the treatment of vascular disorder of the choroid and retina due to arteriosclerosis, vasospasm, macular degeneration, arterial and venous thrombosis or embolism and glaucoma secondary to above mentioned disorders. Otology: For the treatment of impaired hearing of vascular or toxic(Iatrogenic) origin, presbyacusis, menier's disease, cochleovestibular neuritis, tinnitus and dizziness of labyrinth origin. 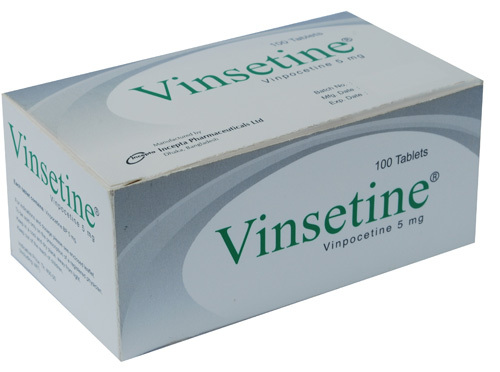 Vinsetine is taken 1-2 tablets three times daily with meals. The maintenance dose is 1 tablet three times daily over long periods. Vinsetine is well tolerated. In some cases transient fall of blood pressure and tachycardia may occur. Because Vinsetine can reduce the ability of blood to clot, those individuals with a tendency to bleed should avoid Vinpocetine.